Pharmaceutical microbiology has a bearing on all aspects of pharmacy, from the manufacture and quality control of pharmaceutical products through to an understanding of the mode of action of antibiotics. 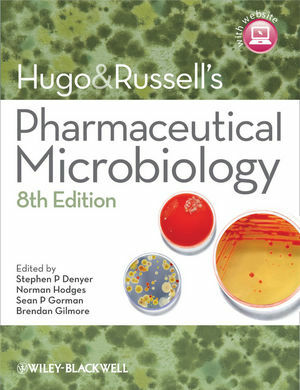 Hugo and Russell’s Pharmaceutical Microbiology, a standard text for Schools of Pharmacy for seven editions, continues to be a user-friendly and authoritative guide for both students and practitioners of pharmacy and pharmaceutical microbiology. Preface to the eighth edition. Part 1 Biology of Microorganisms. 1 Introduction to pharmaceutical microbiology. 2 Fundamental features of microbiology. Part 2 Pathogens and Host Responses. 7 Principles of microbial pathogenicity and epidemiology. 8 Microbial biofilms: consequences for health. 11 Antibiotics and synthetic antimicrobial agents:their properties and uses. 12 Mechanisms of action of antibiotics and synthetic anti-infective agents. 13 Bacterial resistance to antibiotics. 14 Clinical uses of antimicrobial drugs. 15 Antibiotic prescribing and antibiotic stewardship. 16 Public health microbiology: infection prevention and control. Part 4 Contamination and Infection Control. 17 Microbial spoilage, infection risk and contamination control. 18 Laboratory evaluation of antimicrobial agents. 19 Chemical disinfectants, antiseptics and preservatives. 20 Non-antibiotic antimicrobial agents: mode of action and resistance. 23 Principles of good manufacturing practice. 24 The manufacture and quality control of immunological products. Part 6 Current Trends and New Directions. 26 The wider contribution of microbiology to the pharmaceutical sciences. 27 Alternative strategies for antimicrobial therapy.